The EU has often been accused of having a democratic deficit with respect to deficiencies in the representation of citizens in EU decision-making. Joyce Marie Mushaben and Gabriele Abels discuss the role of gender equality in assessments of EU democracy, including the notion that the lack of an adequate gender balance in EU institutions constitutes a ‘double democratic deficit’. They argue that despite improvements in the number of female MEPs, there is still a chronic lack of women in key decision-making positions, particularly in the Commission and the Council. The May 2014 elections to the European Parliament (EP) produced results that are as curious as they are disturbing – and fraught with potentially negative consequences for the future of EU gender equality policies. For the first time since the onset of direct elections in 1979, right-wing parties hostile to the EU itself secured roughly 25 per cent of the EP seats. Growing partisan fragmentation both within and between member-state delegations will affect not only the European Parliament’s policy agenda but also its traditional mode of functioning, given the changes enacted under the Lisbon Treaty (Art. 17) as of 2014. The campaign highlighted issues born of the Eurozone crisis, Europe’s changing role in world affairs, high youth unemployment, and other quality of life concerns with a series of interactive events across Europe. The 2014 campaign slogans – This time it’s different (Commission) and Act, react, impact (EP) – sought to reflect Treaty reforms addressing the Community’s first ‘democratic deficit’, namely, the lack of citizen input into decision-making, coupled with a dearth of transparency and accountability among largely unelected EU officials. The European Women’s Lobby (EWL) devoted its energy and resources to a second, equally intractable democratic deficit – the persistent underrepresentation of women in all EU organs – under the slogan50/50: No more excuses. The EWL’s first charge was to denounce a very sexist campaign video produced in Denmark, a purported bastion of gender equality. The animated clip showed a hyper-muscular super-macho named Voteman who hears an alarm and springs out of bed where he has been cavorting with five naked women, to hunt down and beat up ‘non-voters’ all the way to the polls. Most feminist scholars have consistently recognised the European Parliament as one of the world’s most gender-friendly legislative bodies, and as a driving force behind many equal treatment, positive action and anti-discrimination policies established by the Union. Direct elections were clearly effective in raising the share of female MEPs from 1.3 per cent in 1952, to 4.5 per cent in 1975, to 11 per cent as of 1979, up to 35.1 per cent by 2009. Working closely with the EWL and grassroots networks, women MEPs not only helped to secure new powers for the EP itself; they also contributed to better ‘descriptive representation’ in their home states. The ‘national’ average rose from 11 per cent in 1992 (EU-12), to 28 per cent in 2013 (EU-28). Even foot-draggers like France and Greece have seen double-digit increases since the early 1990s. The attainment of ‘critical mass’ (30 per cent or more) in the 1990s allowed gender-friendly MEPS to engage in countless ‘critical acts’: Forging a positive coalition with the Commission, their ‘hearings’ generated mountains of data attesting to gross inequalities across intransigent member-states. They blocked detrimental Council initiatives and budgetary allocations, built ‘velvet triangle’ alliances among EP committee members, academic/grassroots experts and EU-technocrats, helping them to even halt the appointment of anti-equality Commissioners. Ironically, the European Parliament’s positive gender record stands in stark contrast to the degrees of public indifference reflected in its electoral turn-out, which dropped from a high of 63 per cent (1979), to 57 per cent (1994), to an all-time low of 42.5 per cent (2014); participation rates range from 90 per cent in Luxembourg and Belgium to 20 per cent in Poland and Slovakia. Left-oriented parties warrant a better gender-balance, although 13 member-states saw an actual decline in the overall number of women they are now sending to Strasbourg /Brussels; 13 registered slight increases, raising women’s share of EP mandates 1.8 per cent over 2009. 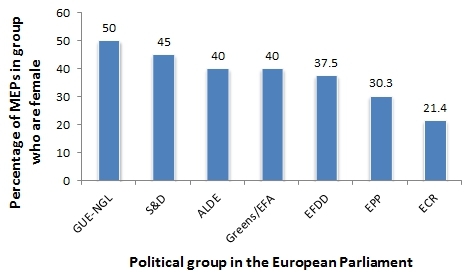 As the Chart below shows, they now occupy 30.3 per cent of the 221 seats filled by the European People’s Party (EPP), compared to 45 per cent of the 191 mandates falling to the Progressive Alliance of Socialists and Democrats (S&D). Female Liberals (ALDE) hold 40 per cent of that group’s seats, reduced to 67 delegates. The United Left/Nordic Greens (GUE-NGL) achieved parity (50 per cent) among their 52 delegates, compared to 40 per cent among the 50 mandates exercised by other Greens and regional parties (Greens/EFA). Among the surprising winners, Eurosceptic, right-wing/conservative parties (including UK Tories) in the ECR group afford women the smallest share, only 21.4 per cent of 70 seats, seven points below the EU average. Note: For more information on the groups in the Parliament see: European United Left–Nordic Green Left (GUE-NGL);Progressive Alliance of Socialists and Democrats (S&D); The Greens–European Free Alliance (Greens/EFA); Alliance of Liberals and Democrats for Europe (ALDE); European People’s Party (EPP); European Conservatives and Reformists (ECR);Europe of Freedom and Direct Democracy (EFDD). A palpable swing to the right did not completely disadvantage women in numerical terms, however, thanks to recent efforts by extremist parties to court the female vote. Ironically, the French parity law promoted by feminists impelled the Front National to place 9 women, out of 23 MEPs, for a share of 39 per cent. Women now account for 47 per cent (8 of 17) of Italy’s Moviemento 5 Stelle slots; the Swedish right-wing boasts of 50 per cent – albeit with only 2 mandates. Women’s advances within the EP’s own power-structure are modest at best; they now supply 6 of 14 EP vice-presidents, and two of five Quaestors; 14 of 33 committee chairs (42 per cent) are female, although men still dominate the ‘big’ ones. Comprising only 16 per cent of the Constitutional Committee members, women are overrepresented (54 per cent) in its Employment and Social Affairs counterpart. TheCommittee on Women’s Rights & Gender Equality (FEMM) is the real outlier, with only 10 men (15 per cent) among its 76 members, though its recommendations are ‘non-binding.’ Its members nonetheless bring substantial gender-expertise to bear in other committees where they serve. Another key to FEMM’s influence has been members’ strong issue-consensus, likely to be disrupted by delegates from Austria’s FPÖ, Germany’s Family Party and the AfD, Slovenian Conservative Democrats, France’s Front National, the Polish Law and Justice party (PiS), and Hungary’s Fidesz and Jobbik, all anti-EU and opposed to redefining gender roles. Despite controlling a majority of votes, equality advocates will face significant stone-walling. Their first victory involved preventing arch-conservative Beatrix von Storch (AfD) from attaining one of FEMM’s four vice-presidential posts. The EP’s unfinished business includes the advancement of quotas for corporate leadership posts, the expansion of maternity protections, and mitigating the women-unfriendly impact of austerity programmes. One difference during this round of elections was the move by eight parties to offer ‘star candidates’, to give the EP elections ‘a human face’; only two were women. For the first time EP results were factored into selecting the Commission President – a body which operated as a ‘woman-free’ zone until 1989. Its 2009-2013 counterpart saw female participation boosted to 33 per cent. In June, President-designate Jean-Claude Juncker urged national governments to nominate at least 10 women for the 2014-2019 Commission; by the July deadline, only two such names were on the table, rising to eight by August, due partly to EP admonitions. Equality advocates recommend requiring all member-states to nominate one man and one woman, affording more presidential choices. Were things really ‘different’ this time around? Not really. Regarding the first democratic deficit, disgruntled yet diffident voters are ostensibly unimpressed by the paltry accountability mechanisms adopted via the Lisbon Treaty, assuming that a majority even know what those improvements entail. In addition to voting, citizens acting across borders (in at least 25 per cent of the member-states) can impel the EU to act on specific issues by submitting a million signatures (out of 506 million residents), for example. Growing fragmentation within member-state delegations and across EP party groups allows for more voice, perhaps, but fewer opportunities for the consensus and compromise which is so essential to democratic pluralism. The EP will have to rely on a ‘Grand Coalition’ presided over by Martin Schulz (SPD); he will have trouble winning the hearts and minds of reactionary parties in those states hit hardest by ‘German-imposed’ austerity programmes. The Lisbon reforms supply no remedies for the second deficit. Although the EP affords greater female representation than most national legislatures, ratios in the more powerful Commission and Council lag woefully behind, despite the EU’s self-imposed mandate to secure ‘the balanced participation of women and men in decision-making’ and gender mainstreamingacross all Community policy domains. This gives rise to three new institutional paradoxes. First, renewed emphasis on national sovereignty and subsidiarity could roll-back the distinctive mode of decision-making (known to feminists as ‘power with’) that has replaced ‘normal’ political decision-making (rooted in ‘power over’) since the early 1990s. Secondly, efforts to remedy the first deficit by (re)involving traditional elites means that national parliaments can now utilise their ‘yellow card’ and ‘red card’ options to block future equality legislation, especially if it costs money or requires employers to share the burden of work/family reconciliation. Finally, multi-level governance is a messy process, but more formalisation and streamlining of EU-internal institutional competencies provides a superficial remedy to the ‘accountability’ deficit, at a high cost to the ‘gender-democratic’ deficit. The more the EU aspires to become a real government depending on hierarchical information flows, organised interest groups, politicised control functions, and formal feedback channels, the less likely it is that new groups (e.g. ethnic minorities, disability organisations) will be to forge the type of innovative coalitions that have produced an astounding equality revolution since 1979, one certainly never anticipated by the Community’s Founding Fathers. There is really little need for a host of new EU gender-quality provisions. The chief problem always was and remains the failure of national governments to implement and monitor an incredible array of ‘fundamental Community values,’ equality directives, regulations and court verdicts already in place. Or as the French would say, plus ça change, plus c’est la même chose. Note: This article gives the views of the authors, and not the position of Democratic Audit, EUROPP – European Politics and Policy, nor of the London School of Economics. Please read our comments policy before commenting. Joyce Marie Mushaben is Curators’ Professor of Comparative Politics & Gender Studies, and former Director of the Institute for Women’s & Gender Studies at the University of Missouri-St. Louis. Gabriele Abels is Professor in the Department of Political Science at Eberhard Karls Universität Tübingen.